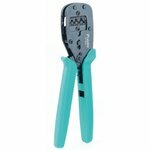 Professional crimping tool for interlocking and non-insulated terminal blocks 2 / 2.3 / 2.6 / 1.6 / 1.4 / 1.3 / 1 / 0.9 / 0.8 mm. 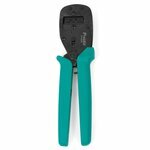 Parallel action crimping tool for non-insulated open barrel connectors (AWG 22-18/16-14/12-10). 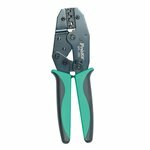 Parallel action crimping tool for commercial type non-insulated open barrel connectors & D-SUB V.35 contact pins. 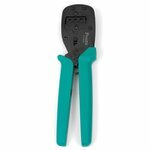 Parallel action crimping tool for commercial type non-insulated open barrel connectors.